Massive bento backlog for me. 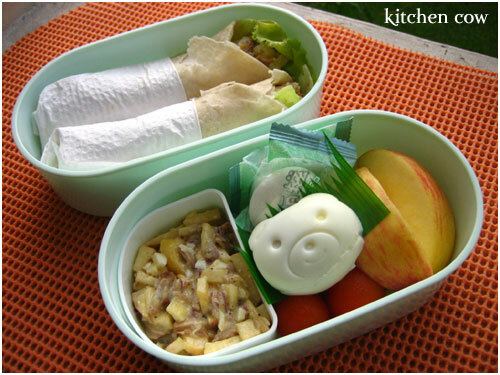 Today’s post is actually a bento from last Tuesday. I had a bento for each day of last week. Quite a record, I think the only other times I managed that was when I was new to this bento thing and was quite enthusiastic about trying out new things. Anyway, last Tuesday’s was an experiment with leftovers. I saw Chef Tristan from the local early morning TV show Unang Hirit whip up something similar, but I couldn’t remember the ingredients. I do remember the use of adobo and yogurt so I figured I’ll wing it from there. â€¢ Adobo salad wraps. Flaked adobo, chopped onions, minced hardboiled egg, and chopped apples, mixed with yogurt then a dash of salt and pepper to taste. Then, rolled on pita with some iceberg lettuce. Verdict? The salad was just so and so. I felt like something was missing, and that the yogurt came on too strong. Chef Tristan recommended using Mango Yogurt since he says the mango goes well with the adobo and I just might do that, IF I decide to give this another shot. I would love to have his actual recipe; did anybody else catch that show? I feel like I missed something, ingredient-wise. â€¢ More adobo salad. I didn’t want to overload my wraps. â€¢ Green tea-filled Marshmallows. Da return of da comeback! Finally, Makati Supermarket has decided to restock these little treats. Hoard bags of them, I did.